On December 25, 1876 a child was born in a prominent mercantile family of Karachi who was destined to change the course of history in South Asia and to carve out a homeland for the Muslims of India where they could pursue their destiny according to their faith and ideology. From his very childhood, young Jinnah developed the habit of stem independence and self-reliance. In 1892, he was called to the Bar at the very early age of 16. He stayed for four year in England and on his return, started his practice in Bombay. The early period was spent in hard and constant labour. However, he soon came to be looked upon not only as a brilliant lawyer, but also as a man of great integrity and character. He was soon elected to the Imperial Legislative Council where he moved the famous Muslim Waqf Bill-the first instance of a Bill passing into legislation on the motion of a private Member. A lover of freedom and a great patriot, Mr. Jinnah began by accommodating the Congress point of view; and was called the, Ambassador of Hindu-Muslim Unity' when he brought about a rapprochement between the Congress and the Muslim League in 1916. He soon felt, however, that the Congress was merely a camouflage for consolidating Hindu India at the expense of Muslim, and it was at the London Meetings of the Round Table Conference during 1930-32 that he received the shock of his life. "In the face of danger" he said, "the Hindu sentiment, the Hindu mind, the Hindu attitude led me to the conclusion that there was no hope of unity". Mr. Jinnah returned from England in 1934, and set out to galvanise the Muslim League into a most dynamic organisation. "We are a Nation" he asserted, "with our own distinctive culture and civilisation, language and literature, art and architecture, names and nomenclature, sense of value and proportion, legal/ laws and moral code, custom and calendar, history and tradition, aptitude and ambitions; in short, we have our own distinctive outlook on life and of life. By all canons of international law we are a Nation." In subsequent years, Mr. Jinnah, popularly known by the title 'Quaid-e- Azam' (the Great Leader), came to symbolise the Muslim aspirations for a separate independent homeland, and in 1940 the Muslim League, under his inspiring leadership, demanded that India should be partitioned and the Muslim majority areas should constitute the sovereign, independent State of Pakistan. It was his ardent advocacy and unbending character, his unshakable determination and his 'Power of persuasion that brought about the successful fruition of the Muslim struggle in the shape of Pakistan. 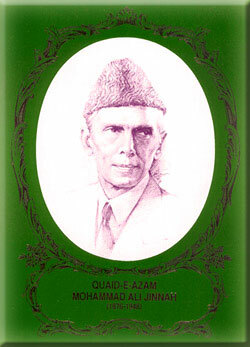 The Quaid was seventy-one when Pakistan was born. He was spared by Almighty only for one year to set the ship of the new State on its keel. Even during the brief period of his Governor Generalship he strove hard to lay down correct precedents for the growth of a democratic tradition in Pakistan. He died on September 11, 1948 deeply mourned by a grateful Nation but as one of the great immortals of history .